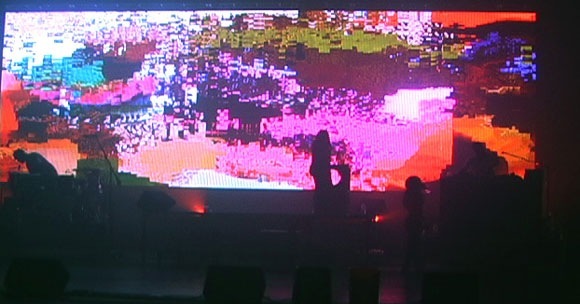 MIA-live glitch test from andrew benson on Vimeo. Our friend Andrew Benson got the attention of MIA here on Create Digital Motion with his real-time glitch creations in Max/MSP/Jitter. Andrew shares some stories from the road with a detailed gig report from Coachella, which reveals a bit of what goes on backstage at these shows. I also really enjoy this clips, because lots of techniques that were once typically pre-rendered or assembled as static motion graphics clips are increasingly applicable in real-time. That makes for an extended palette for visualists – and very good times ahead. Here’s Andrew – a rough and uncut diary, but with lots of juicy details as a result. The big revelation: we need to get out there and evangelize doing things live, with artists major and obscure alike. Early Thursday morning, I flew down to Burbank and was driven directly to this gigantic rehearsal studio called Centerstaging. GnR was also there preparing for their tour this coming summer (what a luxurious amount of prep-time). Upon arrival, I was introduced to the folks I would be working with, and urged to set up quickly and get things running. Maya and the dancers arrived a little later, and we jumped right into it. I worked with a really talented Lighting/Video Director named Arlo and the techs that ran the rented LED video wall. During rehearsals, the wall kept breaking down in mysterious ways, so the tech dude was completely freaked, and none of us were feeling very optimistic about that. During one run-through I had to watch my entire set on my laptop screen. MIA twenty-dollar test stretched from andrew benson on Vimeo. BTW, the concept of doing a bunch of live-processing of video using a laptop is completely amazing to these big-scale production people. Pretty much everyone in the industry just triggers clips from a MBox media server except maybe Nine Inch Nails, so they kept looking over my shoulder in bewilderment. Over the 2 days at Centerstaging, the set list changed at least 3 times, and there was a little bit of indecision about the video content. I had to make a few last minute changes to my patch to accommodate things like mixing in a live camera feed for one song or compositing in flag shots into another song. We unfortunately cut the song "Bucky Done Gun" during the show, for which I had all these great YouTube videos of Somali pirates, glue sniffing kids, and rave-a-delic flag animations prepped. Friday evening during our last run-through I was informed of some "minor" changes that would require me redoing all of the automated state-changes I had done, and adding a number of extra midi triggers to an already complicated logical structure. 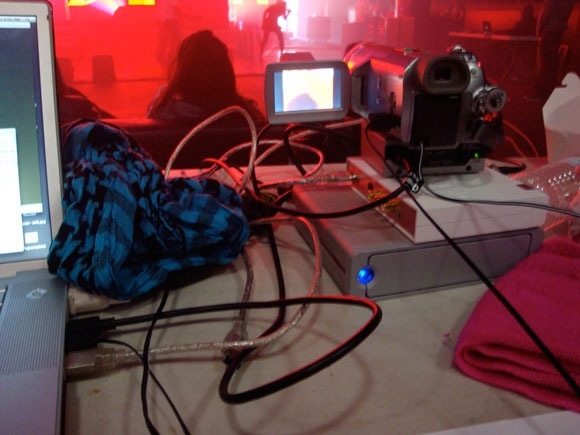 This meant I would be performing with a slightly untested system on Saturday night, and we were still recompressing video in the production trailer at Coachella. I should mention that M.I.A. and all the people that work with her are awesome, totally warm, welcoming and there is this nice informal professionalism that permeates the whole show. I was able to easily voice my concerns and had creative input into the overall look of what I was doing. I kept hearing the whole week how amazing my work was, and how much Kanye is going to love it. More on that in a minute. I drove out to Coachella with Arlo and Andrew Plourde (the guy who runs all the tracks that the DJ doesn’t do and handles a lot of the technology for M.I.A.). We missed the exit and ended up driving another 35 miles before we saw another one. We were put up in a really swanky resort for the night that I got to enjoy for an entire 6 hours before getting up and doing soundcheck. Saturday morning, we had to sound check late because the Killers were moving extra-slow, but our stuff went up easily, and I was able to lobby for a "world" on top of a Killers road case far forward on stage right with a pretty good angle of the video wall. My patch started up quickly and everything worked, but I was getting less-than-perfect framerates. During sound check I was able to test all of the MIDI triggers with Andrew P. to make sure all of that was working. After sound check I wandered around with Mr. Plourde, who also works for Obscura Digital, and he showed me the Heineken rave dome that they had put together for the festival. I didn’t catch much music mostly because it was 95 degrees and I had access to air-conditioned dressing rooms. As TV on the Radio was setting up to play, it dawned on me why I wasn’t getting good framerates, so I ran back to the stage and sat down to debug my patch while they started their awesome set. I was actually able to get things running well, and stripped out a bunch of functionality that ended up getting cut from the show, which helped the framerate. By the time that set was over, my patch was getting an easy 30fps. I also had access to the live camera feed so I recorded a couple minutes of TVOTR going through my processing system. MIA-amazon-demo from andrew benson on Vimeo. I got back from dinner, Kanye West and John Legend were hanging around (they share a tour manager) in the compound. I didn’t really notice so I sat down on the couch and tried to close my eyes for a couple of minutes. By that point I had pixel-brains. I heard Nancy talking about me so I look up and there’s Mr. West with a big old grin on his face. Ha. I had no idea he was actually gonna be there. The show itself was pretty spectacular. The dancers she hired were these hilarious kids from Baltimore she discovered on youtube and were ridiculously talented but had no formal training. They were dressed in these Electro-luminescent outfits designed by Janet from who also did the Daft Punk suits. That part looked really awesome. My live video work didn’t really come in until halfway through the set, so the first little bit was just making sure that things were working and running over my notes. My first song, "$20" went really easy and looked great, but during "Bird Flu" there was a full scale stage invasion by the fans that ended with some dude nearly taking out Andrew P’s laptop and succeeding in yanking the ethernet cable running to the onstage Lemur controller. My rig never suffered for it though, and he recovered quickly. We were running over time, so we clipped Bucky. "Galang" was easy, since I just had to switch on the automated "computer failure" process during the ya-ya-heys and make sure the prebaked parts got triggered at the right moment. 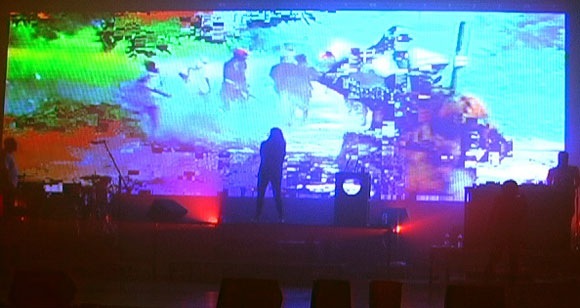 The big finale of the show was the song "Paper Planes" where I really rode the faders and I did a live "datamosh" on Maya’s live camera feed, which was really well shot and had just enough noise in the signal to really make the colors vibrant. From what I can tell it looked awesome, and I was really proud of it. As soon as that ended, we were rushed offstage by the Killers’ crew and I packed up my gear (laptop, ADVC-110, LaCie drive, and korg nanokontrol), had a glass of wine, said goodbye to everyone, and got in the van with the DJs and the dancers back to the hotel in Burbank. Now I’m back in SF, re-immersing myself in normal life and trying to catch up from 2 weeks of distraction. It was a crazy amount of work and super long days, but I would do it again in a minute. and there are a couple of test-clips on my vimeo page. Hopefully more soon.